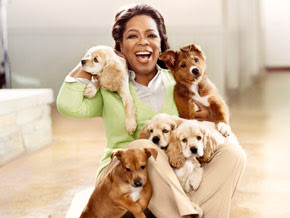 I just purchased the June 2009 Oprah Magazine (the cover picture above) during lunch and this month she focuses on animals and well hello of course I bought this issue! I spent the last 30min devouring the stories and saving the ones I know I will need a tissue on for later. She has a wonderful article called “What are they thinking” by Eugene Linden and it discusses a concept that may be new to many people but not to me. The article warms my heart and talks about recent scientific discoveries proving that animals not only show love but display compassion, reasoning and a desire to not only help one another but humans as well. The article lists many examples that prove that animals not only share the planet with us but co-exist with us. I would like as many people that can to read this article so your eyes can be opened if they are not already are to animals and their amazing capacity to show human emotions. I have such a strong bond with all animals and my heart opens up more each day for them, I think that I was always like this but within the last years I have been able to express this more. God is so good and I know in my heart that he created each animal to be special and every creature has a purpose! This video below is one Oprah has on her website and was mentioned in the article and it is so sweet that while watching this 3min video a huge lump formed in my throat. This video really touched me and I hope it touches you in the same way on this sunny Friday afternoon! Ah, that was great! My kids will love watching this too! Those kinds of stories are such a refreshing break from the usual negativity we a inundated with. Thanks Nicole! I think that is the sweetest story I have ever heard. It is wonderful to know that God made us all this way!